Shiv Charan’s article is an insult to the life of the Sikh GURU, GURU HAR RAI SAHIB JEE who protected animals when Yogi Bhajan hoarded elephant tusks & ivory! Shiv Charan Singh’s endorsement of Yogi Bhajan's elephant graveyard & hoarding of elephant tusks & ivory which defiles the darbar of Siri Guru Granth Sahib Ji with symbols of suffering & death is the height of hypocrisy in light of Shiv Charan’s article he just wrote about the life of the Sikh GURU, GURU HAR RAI SAHIB JEE who exhibited a deep desire to Protect Animals & the Environment! 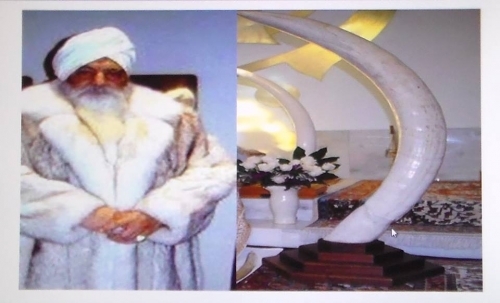 Why is Yogi Bhajan's greed for ivory at the expense of the suffering & death of elephants being sanctioned by SikhNet & Sikh Dharma International when the life of the Sikh GURU, GURU HAR RAI SAHIB JEE exhibited a deep desire to Protect Animals & the Environment? Yogi Bhajan's Elephant Graveyard needs an "Ivory Crush Day"
Why is Yogi Bhajan's Elephant Graveyard & hoarding of elephant tusks & ivory being endorsed by SikhNet & Sikh Dharma International when the life of the Sikh GURU, GURU HAR RAI SAHIB JEE exhibited a deep desire to Protect Animals & the Environment. As a young child Guru Sahib was running in the flower garden at Kiratpur Sahib. He was wearing a baggy cloak (Chola). While running the cloak he brushed passed some flowers, thus the flowers were damaged. With love and compassion, Guru Hargobind Sahib jee, the seventh Guru's grandfather, explained: "Always walk and move with care. Look after and manage your cloak and ensure that it doesn't hurt or damage anything in its path." Guru Hargobind Sahib jee taught his grandson that "one should watch how one walks" and work on oneself. Guru Sahib promised his grandfather, that he would in the future be careful in his responsibilities towards man, animals and plants. Boundless compassion and charity were reflected in all his actions and dealings with others throught Guru Sahib's life. 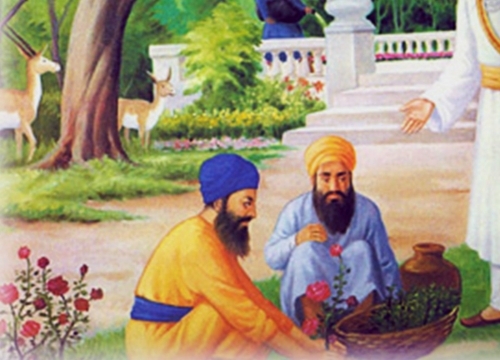 Guru Sahib founded free hospitals, herbal medical clinics, animal sanctuaries and beautiful gardens. Guru Har Rai Sahib jee developed Kiratpur sahib as a town of parks and gardens. Located on the banks of tributary of the Sutlej, he planted flowers and fruit bearing trees all over the area. This created a salubrious environment, attracting beautiful birds to the town and turning it into an idyllic place to live in. The Guru would go hunting; capturing animals he would care for them and give them treatment. When the animals were healthy and fit they would be released into the animal sanctuary or wild.